Las emociones han adquirido una importancia creciente en nuestra época, en todos los ámbitos de la sociedad. Esta revalorización de la dimensión afectiva de la persona se ha reflejado, a su vez, en su inclusión como objeto de estudio en investigaciones de numerosas ramas del saber. También dentro de los estudios en Comunicación, y en concreto en relación con la tecnología digital, existe un interés académico por las emociones. Por medio de una profunda revisión bibliográfica, en este trabajo se traza un mapa del campo de estudio en el que convergen las emociones y la tecnología digital; más concretamente, en el uso de Internet. En él se advierte un campo de investigación vibrante, amplio y complejo, en el que confluyen aproximaciones de diferente tipo, tanto en el plano teórico como en el metodológico. El artículo presenta un panorama de las investigaciones realizadas en esta materia, que abarca desde el estudio de las redes sociales como espacios de interacción en el que las emociones son expresadas, el contagio emocional a gran escala o el análisis de sentimientos en las plataformas digitales. Se concluye que la Red no sólo despierta emociones en sus usuarios y sirve de cauce para la expresión de los afectos, sino que también influye en el modo en que dicho afecto se modula y despliega, así como en la configuración de la identidad de la persona. Ben-Ze’ev, A. (2004). Love Online. Emotions on the Internet. New York: Cambridge University Press. Bendelow, G., & Williams, S.J. (Eds.) (1998). Emotions in Social Life: Critical Themes and Contemporary Issues. London: Routled­ge. Benski, T., & Fisher, E. (2014). Introduction: Investigating Emotions and the Internet. In T. Benski, & E. Fisher (Eds. ), Internet and Emotions (pp. 1-14). New York: Routledge. Boyns, D., & Loprieno, D. (2014). Feeling through Presence: To­ward a Theory of Interaction Rituals and Parasociality in Online Social Works. In T. Benski, & E. Fisher (Eds. ), Internet and Emotions (pp. 33-47). New York: Routledge. Cefai, S. (2014). The Lesbian Intimate: Capacities for Feeling in Convergent Media Context. Participations: Journal of Audience and Reception Studies, 11(1), 237-253. Chiyoko-King-O’Riain, R. (2014). Transconnective Space, Emo­tions and Skype: The Transnational Emotional Practices of Mixed International Couples in the Republic of Ireland. In T. Benski, & E. Fisher (Eds. ), Internet and Emotions (pp. 131-143). New York: Routledge. Clough, P. T., & Halley, J. (2007). The Affective Turn: Theorizing the Social. Durham: Duke University Press. Dobele, A., Lindgreen, A., Beverland, M., Vanhamme, J., & Van-Wijk, R. (2007). Why Pass on Viral Messages? Because They Connect Emotionally. Business Horizons, 50, 291-304. Eco, U. (1964). Apocalittici e integrati: comunicazioni di massa e teorie della cultura di massa. Milano: Bompiani. Fortunati, L., & Vincent, J. (2009). Introduction. In J. Vincent, & L. Fortunati (Eds. ), Electronic Emotion. The Mediation of Emotion via Information and Communication Technologies (pp. 1-31). Bern: Peter Lang. Fortunati, L., Pertierra, R., & Vincent, J. (2012). Migration, Dias­pora and Information Technology in Global Societies. London: Routledge. Fürst, H. (2014). Emotional Socialization on a Swedish Internet Dating Site: The Search and Hope for Happiness. In T. Benski & E. Fisher (Eds. ), Internet and Emotions (pp. 99-112). New York: Routledge. Garde-Hansen, J., & Gorton, K. (2013). Emotion Online. Theoriz­ing Affect on the Internet. Basingstoke: Palgrave Macmillan. Gómez-Cabranes, L. (2013). Las emociones del internauta. In L. Flamarique, & M. D’Oliveira-Martins (Eds. ), Emociones y estilos de vida: Radiografía de nuestro tiempo (pp. 211-243). Madrid: Biblio­teca Nueva. González, A.M. (2013). Introducción: emociones y análisis social. In L. Flamarique, & M. D’Oliveira-Martins (Eds. ), Emociones y estilos de vida: radiografía de nuestro tiempo (pp. 9-24). Madrid: Biblio­teca Nueva. Hermida, A. (2014). Tell Everyone. Why We Share & Why It Matters. Toronto: Doubleday Canada. Jakoby, N.R., & Reiser, S. (2014). Grief 2.0: Exploring Virtual Cemeteries. In T. Benski, & E. Fisher (Eds. ), Internet and Emo­tions (pp. 65-79). New York: Routledge. Kappas, A., & Krämer, N.C. (Eds.) (2011). 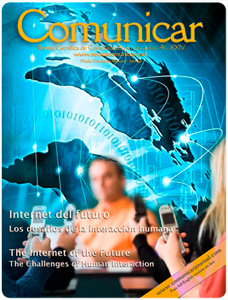 Face-to-face Commu­nication over the Internet: Emotions in a Web of Culture. Cam­bridge: Cambridge University Press. Karatzogianni, A., & Kuntsman, A. (Eds.) (2012). Digital Cultures and the Politics of Emotion: Feelings, Affect and Technological Change. Basingstoke: Palgrave Macmillan. Kaufmann, J.C., & Macey, D. (2012). Love Online. Cambridge: Polity. Kramer, A.D., Guillory, J.E., & Hancock J.T. (2014). Experimental Evidence of Massive-scale Emotional Contagion through Social Networks. Proceedings of the National Academy of Sciences of the United States of America (PNAS), 111(24), 8.788-8.790. Küster D., & Kappas, A. (2014). Measuring Emotions in Individuals and Internet Communities. In T. Benski, & E. Fisher (Eds. ), Internet and Emotions (pp. 48-61). New York: Routledge. Lasén, A. (2010). Mobile Media and Affectivity: Some Thoughts about the Notion of Affective Bandwidth. In J.R Höflich, G.F. Kircher, C. Linke, & I. Schlote, (Eds. ), Mobile Media and the Change of Everyday Life (pp. 131-154). Frankfurt am Main: Peter Lang. Lasén, A. (2014). Introducción. Las mediaciones digitales de la educación sentimental de los y las jóvenes. In I. Megía Quirós, & E. Ro­dríguez-San-Julián (Coords. ), Jóvenes y comunicación. La impronta de lo virtual (pp. 7-16). Madrid: Fundación de Ayuda contra la Drogadicción. Pantti, M., & Tikka, M. (2014). Cosmopolitan Empathy and User-Ge­nerated Disaster Appeal Videos on YouTube. In T. Benski, & E. Fisher (Eds. ), Internet and Emotions (pp. 178-192). New York: Routledge. Peyton, T. (2014). Emotion to Action? Deconstructing the Onto­logical Politics of the ‘Like’ Button. In T. Benski, & E. Fisher (Eds. ), Internet and Emotions (pp. 113-128). New York: Routledge. Risi, E. (2014). Emerging Resentment in Social Media: Job In­security and Plots of Emotions in the New Virtual Environments. In T. Benski, & E. Fisher (Eds. ), Internet and Emotions (pp. 161-177). New York: Routledge. Roeser, S. (Ed.) (2010). Emotions and Risky Technologies. New York: Springer. Sampson, T. (2012). Virality. Contagion Theory in the Age of Networks. Minessota: University of Minnesota Press. Schofield-Clark, L. (2014). Mobile Media in the Emotional and Moral Economies of the Household. In G. Goggin, & L. Hjorth (Eds. ), The Routledge Companion to Mobile Media (pp. 320-332). New York: Routledge. Solomon, R.C. (Ed.) (2003). What Is an Emotion? Classic and Contemporary Readings. Oxford: Oxford University Press. Svensson, J. (2014). Power, Identity, and Feelings in Digital Late Modernity: The Rationality of Reflexive Emotion Displays Online. In T. Benski, & E. Fisher (Eds. ), Internet and Emotions (pp. 17-32). New York: Routledge. Turner, J.H., & Stets, J.E. (Eds.) (2007). Handbook of the So­ciology of Emotions. New York: Springer. Vincent, J., & Fortunati, L. (Eds.) (2009). Electronic Emotion. The Mediation of Emotion via Information and Communication Technologies. Bern: Peter Lang. Wahl-Jorgensen, K. (2013). Emotional Architecture of Social Media: The Facebook ‘Like’ button. 63rd Annual Conference of the International Communication Association (ICA). London (UK), 17-21/06. Walter, T., Hourizi, R., Moncur, W., & Pitsillides, S. (2012). Does the Internet Change How We Die and Mourn? Overview and Analysis. Omega: Journal of Death and Dying, 64(4), 275-302. Crespo-Pereira, Veronica; Martinez-Fernandez, Valentin-Alejandro; Campos-Freire, Francisco;. Neuroscience for Content Innovation on European Public Service Broadcasters COMUNICAR , 2017. Doval-Avendano, Montserrat; Dominguez Quintas, Susana; Alvarez de Sotomayor, Isabel Dans;. RITUAL USE OF SCREENS AMONG YOUNG UNIVERSITY STUDENTS A DIGITAL DIET EXPERIENCE PRISMA SOCIAL , 2018. Fernandez-Fernandez, Diego; Calvo-Gonzalez, Soraya; Rodriguez-Perez, Sara;. It's a Match! Self-representations and communicative features on young people's Tinder interactions REVISTA MEDITERRANEA COMUNICACION-JOURNAL OF COMMUNICATION , 2018. Ferres, Joan; Masanet, Maria-Jose;. Communication Efficiency in Education: Increasing Emotions and Storytelling COMUNICAR , 2017. Lemus; Magdalena;. 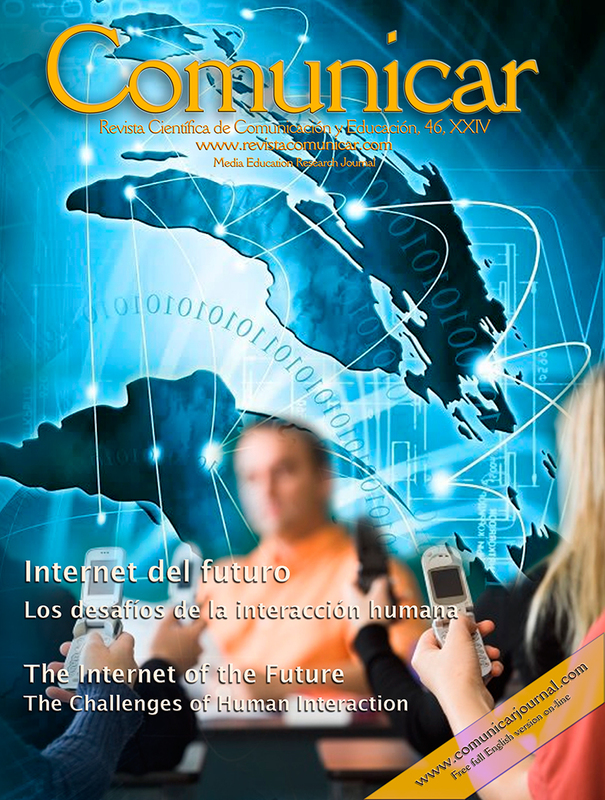 Revista Latinoamericana de Ciencias Sociales, Niñez y Juventud , 2017. Lemus; Magdalena;. Ciencia, docencia y tecnología , 2017. Mario Litterio, Arnaldo; Alberto Nantes, Esteban; Manuel Larrosa, Juan;. Marketing and social networks: a criterion for detecting opinion leaders EUROPEAN JOURNAL OF MANAGEMENT AND BUSINESS ECONOMICS , 2017. Martinez Morales, Maria; Bermudez Vazquez, Virginia;. Re-inventing (us): processes of collective creation as new spaces of investigation based on the digital media REVISTA ICONO 14-REVISTA CIENTIFICA DE COMUNICACION Y TECNOLOGIAS , 2018. Qing Huan; Niu ZhanWen;. Knowledge management in consultancy involved LPS implementation projects via social media ELECTRONIC COMMERCE RESEARCH , 2018. Reisz, Robert D.; Szabo, Lucian-Vasile;. EMOTIONAL CONVERGENCE IN MASS AND SOCIAL MEDIA IN ELECTION. CASE STUDY: ROMANIA 2014 TRANSYLVANIAN REVIEW OF ADMINISTRATIVE SCIENCES , 2017. Salcudean, Minodora; Muresan, Raluca;. The Emotional Impact of Traditional and New Media in Social Events COMUNICAR , 2017. Crespo-Pereira, V., Martínez-Fernández, V.-A., Campos-Freire, F.. Neuroscience for content innovation on European public service broadcasters), Comunicar, 2017. Doval-Avendaño, M., Quintas, S.D., De Sotomayor, I.D.Á.. Ritual use of screens among young university students a digital diet experience | El uso ritual de las pantallas entre jóvenes universitarios/as una experiencia de dieta digital), Prisma Social, 2018. Ferrés, J., Masanet, M.-J.. Communication efficiency in education: Increasing emotions and storytelling), Comunicar, 2017. Huan, Q., ZhanWen, N.. Knowledge management in consultancy involved LPS implementation projects via social media), Electronic Commerce Research, 2018. Litterio, A.M., Nantes, E.A., Larrosa, J.M., Gómez, L.J.. Marketing and social networks: a criterion for detecting opinion leaders), European Journal of Management and Business Economics, 2017. Nieto Moreno De Diezmas, E., Dondarza Manzano, P.. PLEs in primary school: The learners' experience in the piplep project), Digital Education Review, 2016. Perán López, J., Berlanga Fernández, I., Galmés Cerezo, M.. Neuromarketing strategies in the Mobile Phone companies' homepages | Estrategias comunicativas en las homepages" de empresas de telefonía móvil. Una visión desde el neuromarketing), Espacios, 2017. Reisz, R.D., Szabo, L.-V.. Emotional convergence in mass and social media in election. case study: Romania 2014), Transylvanian Review of Administrative Sciences, 2017. Salcudean, M., Muresan, R.. The emotional impact of traditional and new media in social events), Comunicar, 2017. Zaharna, R.S.. Global engagement culture and communication insights from public diplomacy), The Handbook of Communication Engagement, 2018.